Copy of AIRSIDE BUSINESS PARK — Burchick Construction Company Inc. This project consisted of two (2) three-story office buildings totaling 207,000 square feet on the site of the former Greater Pittsburgh International Airport. Also included was a two-story cast-in-place concrete parking garage, tenant fit-out, and sitework. The Owner received bids for the conventional construction of a steel frame building with precast concrete exterior walls and an alternate for tilt-up exterior walls. Burchick Construction Company, Inc. saved the Owner $600,000 using the tilt-up method, the first of its kind in the Pittsburgh area. 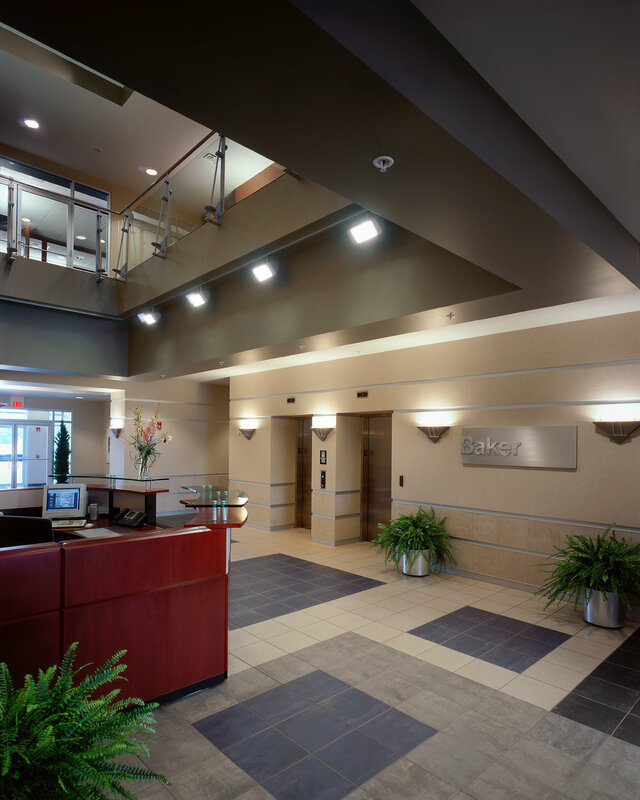 Burchick Construction worked closely with the Owner bidding the office buildings on a Guaranteed Maximum Price basis and then returned savings on each phase. This was the first time that the tilt-up construction method was used for Class A office space in the Pittsburgh area. The tilt-up method required detailed coordination for the structural integrity of the full height three-story exterior walls with three hundred openings. The concrete panels were poured on the building slab, and sequenced for erection to maintain the project schedule. Burchick Construction self-performed all the sitework concrete, grading, and storm water management system, as well as all the concrete tilt-up panels, building concrete, interior drywall, metal studs and acoustical ceilings. The result was two Class A office buildings with a unique look, which are now the models for future office buildings in the Airside Business Park.